More sections of JoVE (Journal of Visualized Experiments) now available! The Library is happy to announce we have added access to four more sections of JoVE/Journal of Visualized Experiments. If you need any help with this or any other Library resources, please do not hesitate to contact us. Science Translational Medicine now available! The Libraries are pleased to announce that we now have a subscription to the journal Science Translational Medicine. You will be able to retrieve articles for the entire run of this title from 2009 to the present. When off-campus, you will need to authenticate in order to access this journal either by using your LSUHSC-NO e-mail and password via OpenAthens or your Library barcode and PIN. Off-campus information is available here. We know this is a journal that will be of great use, and are glad to finally add it to our subscriptions. If you need any help with this or other Library resources, please do not hesitate to contact us. 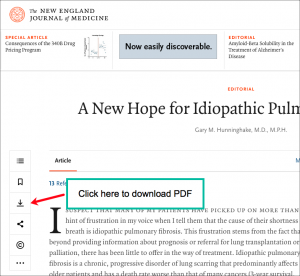 New England Journal of Medicine redesigned their website, and the “Download PDF” link has a new appearance. Instead of a link that says “Download PDF”, it is now represented by an arrow pointing down. The download arrow symbol is located on the left side of each article’s page. If you have any questions, do not hesitate to contact the Circulation Staff! Tags: Medicine, NEJM, New England Journal of Medicine | E-Journal News, E-Resource News, Medicine | Permalink | Comments Off on New England Journal of Medicine PDF Downloads | Posted Tuesday, January 30, 2018 by Corder, Amy L.
The Library is happy to announce we finally have subscriptions to six sections of JoVE/Journal of Visualized Experiments. This is one of our most-requested journals, and although we were unable to subscribe to the full journal, we hope the sections we are able to get will be of use. One issue we would like to point out is indexing of JoVE in PubMed: all sections are handled as belonging to one journal, so please be sure the video you need belongs to one of the six sections above. We examined statistics for these journals over a number of years in order to get a better picture of usage trends. The Library will still maintain access to older volumes, and if you need a more recent article you may request it via our Interlibrary Loan Service. If you have any questions or need assistance with any Library resources, please contact us. Although we are hoping that our system will not be down for the bulk of the day, if you need an article during this time here are a few tips and an alternative to get articles during this downtime. If you want to check whether the Library owns a journal, the E-Journals & E-Books A to Z List is a good source but only from on campus; unfortunately, the majority of links on the list will not work as they rely on talking with our system in order to get you to the journal. There is no guarantee that we have access rights to the journal, though, but this is a way to get to the article while our system is down. Even though INNOPAC, the Library’s catalog, will not be available, Library staff will have other ways to get to journals and resources during this downtime, so please contact us if you need help. We are currently having trouble with off-campus access and journals we receive from Oxford University Press, so these titles will be available on-campus only until the problem is fixed. You will see a note indicating on-campus only restrictions for these journals displayed in links from the Library Catalog, A to Z List, and link resolver. As soon as the issue is resolved, we will restore off-campus access. If you need assistance when off-campus in retrieving articles from Oxford journals, please contact us. The issue with ScienceDirect has been fixed, so links in the Library Catalog, A to Z List, and link resolver should all now work correctly. If you need assistance with any Library resources please contact us. 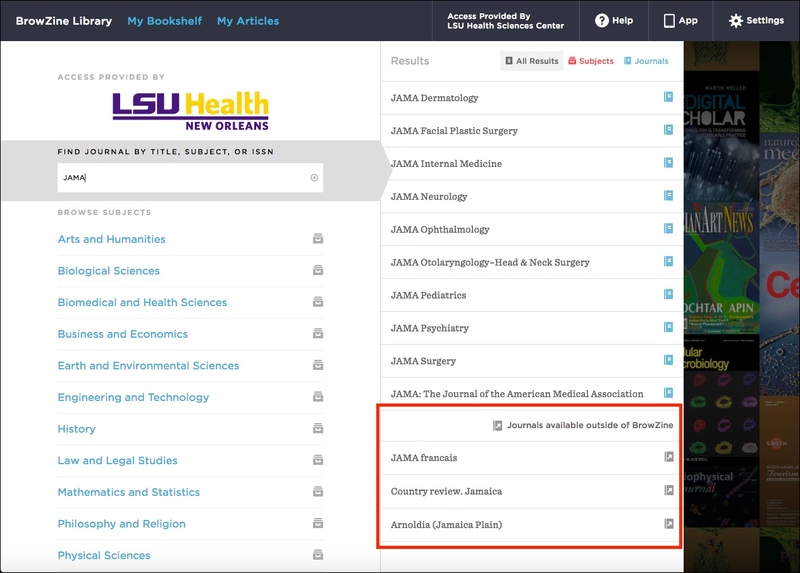 BrowZine recently rolled out two new features that supplement the ability to find journals on your favorite topics and also to save articles you’d like to read later. You will not be able to add these titles to your BrowZine bookshelf, but they may be helpful when you’re looking for journals that pique your interest. A second new feature just rolled out is called “My Articles.” This is new to the web version of BrowZine, and builds upon an option available in the mobile version of the service. 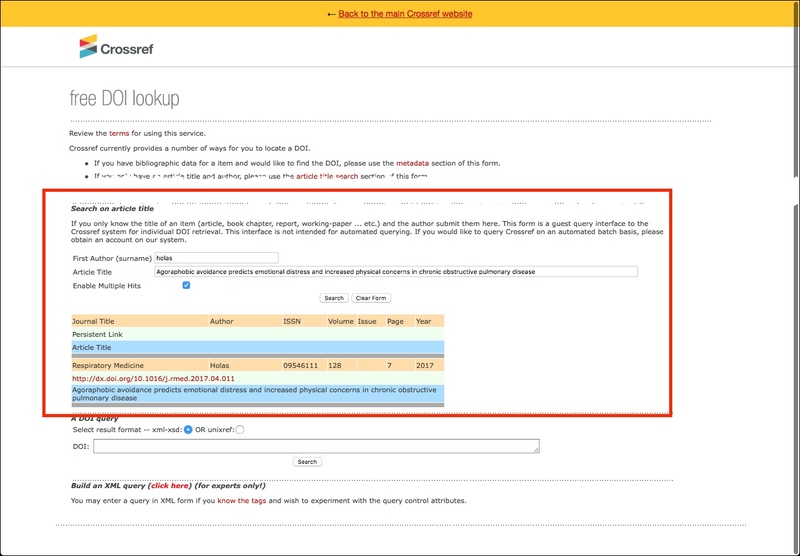 A walkthrough about this new feature, including limitations for offline browsing, is available on the About My Articles page on the BrowZine Support site. If you need any help with BrowZine or any other Library resources, be sure to contact us.